Here they come: a slew of late summer and early fall men’s mainstream and designer fragrance launches. I have weeks’ worth of reviewing ahead of me, and everyone who reads this blog regularly knows the chances are slim that one of these fragrances — designed to appeal to a wide audience, everyone from collegiate Lotharios to middle-aged chiropractors — will strike a new chord (or accord) and please me (let alone thrill me). Kenzo Power was the first to arrive at my doorstep and if any of you watched the Olympics, you know “performing” first has its pitfalls — the first performer does not want to be average, he wants to astound and dominate the field. Kenzo Power, “A Flower for Men,” was created by perfumer Olivier Polge and is described in Kenzo’s PR materials as “an imaginary flower in the heart of a woody amber-y fragrance”. Kenzo Power contains bergamot, coriander, cardamom, an abstract floral note (created using jasmine, rose and freesia), tolu balsam, cedar wood and labdanum. I like Kenzo Power’s heavy, Kenya Hara-designed stainless steel container (in the shape of a sake bottle). Kenzo Power is available in Eau de Toilette (60 ml., $55, 125 ml., $75, 750 ml. $300) and grooming products; it launches this month in the U.S. at Bloomingdale’s and in Canada at The Bay. 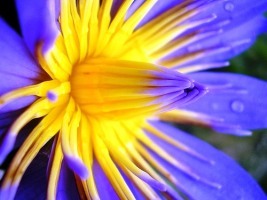 Note: first image is A blue tropical waterlily 1 by tanakawho at flickr; some rights reserved. Thanks for the review! Isn't it funny how this is a fragrance that ends up smelling “better” on clothing than on skin? This should be on Australian shelves anytime now and I'm looking forward to trying it. Speaking of He Wood, it's finally coming here down under in Q4 of this year (I forget the exact month – October? ), so it may very well reach American shores soon! eminere: it is strange…I got He Wood just a few hours from Seattle…up in Canada…last December. Who knows why it's taken so long to be released in the U.S.! That it s good tip, Kevin. My boyfriend loved Kenzo Tokyo on a paper strip and that was going to be my next purchase for him… You say try on Your skin first, sounds like a little warning. That's what we'll do, I'ind a sample first n let him see on the skin. This sounds quite interesting. I've had good luck with mens frags in the past (I wear John Varvatos in the winter eg) & tend to the watery florals in the summer, so I'll have to try this. Not sure if hubby would like it, but sounds like a nice fragrance for me, and I love the stainless steel bottle! Iris: lots of fragrances smell better “on paper” and fall flat on skin. Get a sample! Licia: this smells like a TRUE unisex fragrance to me. SFLiz: the bottle is nice! It really does, doesn't it? I'm surprised they aren't marketing it as unisex (don't know if Kenzo has ever done that, I'm not familiar with much of the brand beyond Flower & Amour). Hi Kevin. I caved this summer and bought Jo Malone's Lotus Blossom & Water Lily (mainly because they used a “manufactured scarcity” ploy and I panicked). This almost sounds like a variation on that theme, so I probably won't go out of my way to try it (however, KenzoAir has been near the top of my FBW list for a couple months now). Frankly, after waiting for HeWood to make it to these shores, I've moved on, though I liked it. Also, I now need some woody, darkish fall scents — I don't understand why these launches don't make more seasonal sense. LOVE that image, by the way! I have a sample of Lotus Blossom & Water Lily but have not tried it yet…I'll do that and see if there's any similarity with KP. And I'm hauling out the fall scents too…we've had a chilly late summer here. I have to say that I really like this one. It's just so different from most other male fragrances from the big brands. I thought it was amazing at first, but after a few days, I tired of it quite a bit. Still a great effort though! I thought Tokyo was GREAT — for about ten minutes. Then it just disappeared off my skin. You have now given me incentive to go back and try it on my clothing, I hadn't thought of that. For some reason I love that bottle. I think most of the Kenzos look nice. Dear Kevin, my partner commented on how different Kenzo Tokyo smells on a coworker that seems to spray it on clothes rather than skin… certainly the development is way different! PC: reading other online comments, most men seem to like Kenzo Power. Riverwide: yes, a good change of pace..hope that FLOWERS of some sort can be worked into more men's mainstream fragrances…smalll steps! March: the Kenzo bottles ARE fun aren't they? I, insanely, bought a big bottle of He Wood and will happily send you a sample…a BIG one! Kenzo Tokyo was a HUGE disappointment: I bought it in London after smelling it on a blotter, and I thought it was gorgeous. When I got home and actually put it on my skin…it was like some fifteen-dollar department-store rubbish with a celebrity name on it. I'm still willing to give Kenzo Power a shot, because FlowerByKenzo was so good. R: I do think you might like it. If you still have your Tokyo spray it on your winter scarf? It smells SO much better on fabric/paper, you can get some interesting notes coming thru that way. Joe: your hunch was correct! KP DOES smell a bit like Jo Malone Lotus Blossom, but LB is darker and spicier…I could see wearing it in fall. Thank you Kevin…I like it…a change of pace from my usual lineup…and yes fabu bottle! I am unfortunately a fragrance lover whose skin soaks up most scents rather quickly..my coworkers perfumes all almost seem to last all day..I get whiffs when passing each other in the stock room…they say it's because they spray in their hair…I unfortunately am a shaved head man….maybe in my goatee? LOL! I'd prob miss and spray in my mouth. bklyn: in addition to all the usual application zones, I do spritz the back of my not-quite-clean-shaven-but-closely-buzzed-head and sometimes the top too. Since even a buzzed scalp is a little bit oily, I like to think it helps at least a little with longevity. Then again there's always the chest hair. Ha! It was very much just a hunch based on your mention of that “water lily” accord. If the Jo Malone is “darker and spicier” then I can't imagine really caring for the Kenzo at all — JMLBWL is about as “watery” as I want to get. I do like the development of it — it's very sheer, and there's something green yet spicy about it. I just sprayed some on and I think it reminds me just a bit of the green-spice-sap of Apres la Mousson. It's interesting how they're coming up with these “watery floral” accords that aren't ozonic in a nasty synthetic way; Marina at PST has written a couple reviews on that topic recently that I found interesting. Joe: from my quick wearing of the Jo Malone, I do prefer it to Apres la Mousson…but it didn't last long on my skin. March: just look in “About”, top left of your screen, and write me at my gmail acct. Am I the only one who gets a huge iris note in the top notes of Power? Or is my nose confusing iris for one of the other flower notes you mentioned?? Mike: I love iris and don't smell a smidgen in this though there is a nice powdery component to the bergamot-vanilla that I smell in the opening. Could be a failure of my nose…. tungbeobeo83: Kenzo Power is not 'sweet'…and you know the ONLY way to avoid being betrayed is never, ever buying a scent without wearing it all day. Get a sample from your retailer and pour it on for the day. If you can't get a sample, don't buy it! I finally got to test this today, on skin, and I urge anyone who also has access to a Jo Malone counter to compare this with the Parma Violets Linen Spray. They smell almost identical it's quite remarkable.